After finally finding time to catch up on new Dr Who over the weekend, I was inspired to write a little about the music of the cosmos. We don’t usually think of the stars as being intrinsically noisy, but since the advent of Radioastronomy it has become possible to ‘listen’ to some of the signals echoing toward us through space and time. 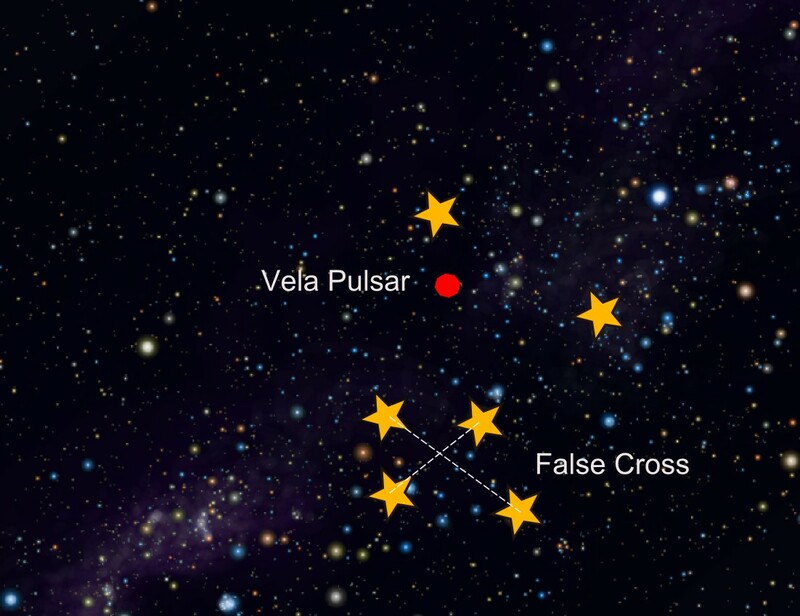 This is the sound of the Vela Pulsar, a highly magnetised neutron star, beaming out radiowaves as charged particles accelerate toward it. These radiowaves are ‘focussed’ along the magnetic poles of the star (the pink areas in the image to the right) and , like beams of light from lighthouses, as the star rotates they sometimes ‘wash’ over the earth. 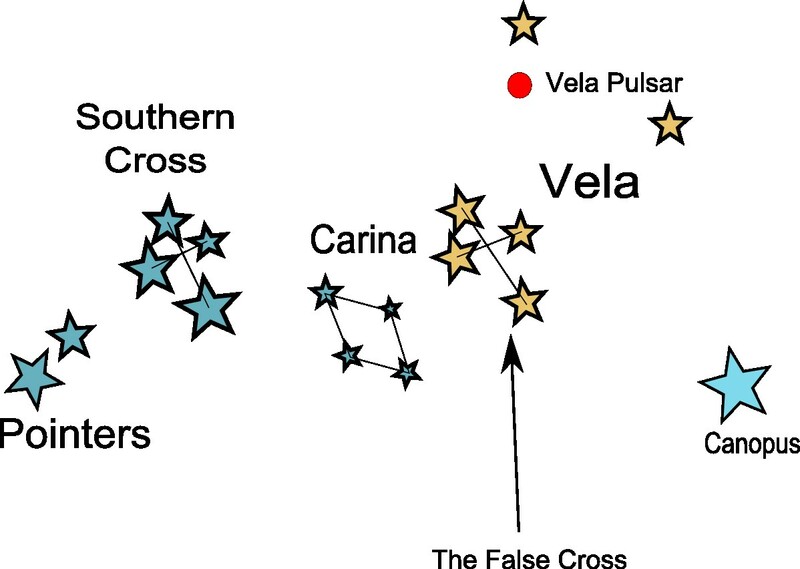 Now here’s the cool bit, there stars are tiny (10-15km across) and yet super dense (i.e. one teaspoon of a neutron star has a mass roughly the same as the earth) and so they can spin incredibly fast, turning the signal on-and-off many times per second, which is what is used to generate the ‘sound’ above. 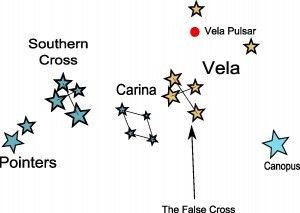 Carina/Vela stars showing Pulsar Location. Identical to left image. There are a number of other famous pulsars you can listen to, including one from the Crab nebula here, but my favourites have to be from within the 47 Tucana cluster (look back a couple of posts of you want to locate it). 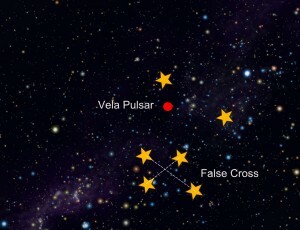 The first one, here, is the sounds of several different pulsars from within the cluster, and the second one, here, are the same stars, but with atmospheric effects left in. So, with these ‘songs’ stemming from old dead stars, long after they have supernova’d, and with supernova candidates like Betelgeuse and Eta Carina bright in our skies I can’t help but wonder how the future songs will sound, and what glorious sights and sounds the universe has left in store for us! Bring on the SKA and lets take a look from NZ. Easiest was to look around the sky – eat your heart out Google sky!